Bill Gates, the richest man in the world with the net worth $79.2 billion, had been reported to have visited in the Philippines since Black Saturday and was only spotted when he visited Los Baños, Laguna for six hours. The Microsoft cofounder was seen on April 8, 2015 in the headquarters of International Rice Research Institute (Irri). It is a rare visit and only a few had been notifies about it. Irri is one of the fortunate grantees of Gates’ foundation. The American billionaire’s trip in the Philippines started on April 4, 2015 when immigration sources confirmed that William Henry Gates had landed in Puerto Princesa City in jet a private identified with US registry number N887WM. He seemed to be planning to keep his visit under radar until he was seen in Irri. A few sources in Irri who refused to be named confirmed that the visit was just six hours. Irri is located in the compound of University of the Philippines Los Baños. It is around 66km away from the heart of Manila. A source also said that Gates seemed to be dressed in simple clothes much like in his photos. He seemed to be a low profile person despite being named as the richest man in the world by Forbes. He had arrived in Irri in a helicopter at 8:59 a.m. And went to the Irri boardroom, the experimental rice fields and gene bank. He left at around 3 p.m. after having lunch. The visit was meant to be confidential as it was not even announced in a memorandum to the Irri employees. Some special visitors visit the place but not as confidential as Gates’. 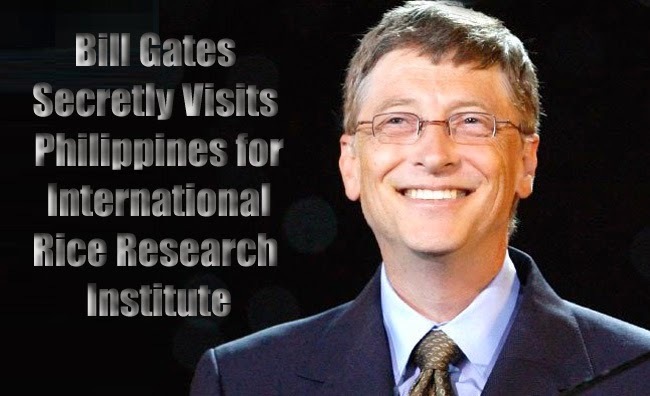 Gates is said to be the biggest donor of Irri through his well known foundation.